The film is coming along great. Later on; these images will be projected on to the final geometry. They're 6x3k resolution. I played around with some more Dynamics. This is still work in progress. Here I combined nCloth and a Fluid system, to try and create a fire erupting with great power from below ground. Currently I'm tweaking the Fluids mostly, and I still need to find the optimal setting for rendering. My plan is to separate the two using an alfa, and later on combining the two in After Effect, where I'll add extra effects and color on the fire. Once I have worked out and polished the technical side of things; I'll re-direct my focus to polish the look and animation, so the stone pieces will be shattered with a lot more force. 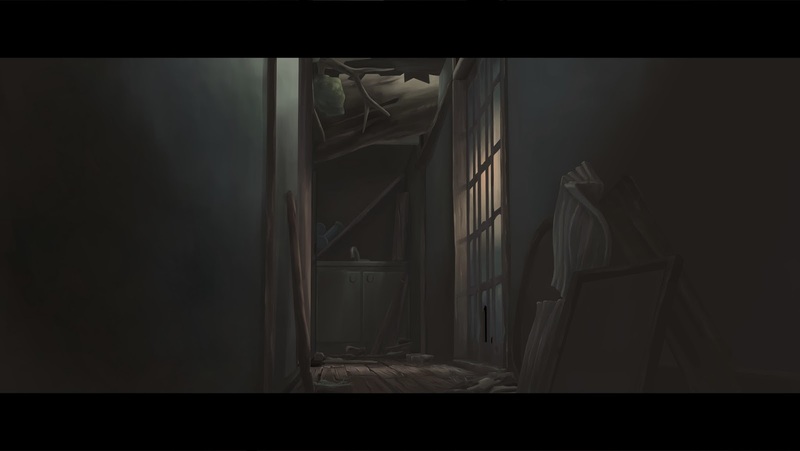 Since January I have been working on modelling sets and props for the Short-film with the temporary title "Haru" Most of the film takes place on the upstairs of a house, which has been modelled as a single set, in order to save production time. All our sets needed to be finished before we started painting and texturing, as that will happen through projection. So instead of set-dressing we will need all sets, details and debris being finished beforehand. To speed up the process; I have been creating several Unwrapping and UV scripts, to speed up the proccess, as they need to be very clean in order to get the best results from Mari. See the previously posted look-test for a more polished result. Here are a few of the early water tests I created for our film. I created these before December, but the techniques were very useful, and showed good promise for our film. This test was created using an animated texture for the water; and using seperate planes around the test-geometry. I had done a quick 2d animation of tileable water ripples, which I used as the animated texture. The ripples can then be copied infinitely despite they are animated, and be stretched and distorted. That will save us a lot of time on the animation, so instead they can focus more on the character animation, as we will only need a tile-able animated ripple sequence, which can later be used for all ripples around geometry. The 2nd test I created was made by using the ocean shader. I rendered it on to a plane, where I added post-effects on the entire sequence in Photoshop. The 2D Animation was animated by Pernille Nielsen, and was added on top. Currently the plan is to use 2D animation for the splashes of water in the film, which we later will composite in NukeX. Another Reel will be created during fall, once the "Haru" film is finished. It is finally out on the interwebs! 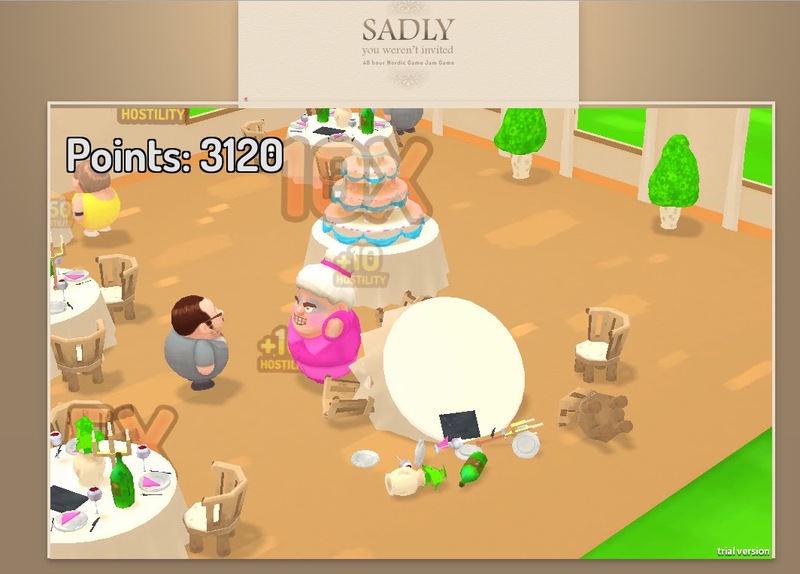 Our game "Sadly, you weren't invited"
I created and painted all the static assets, such as tables, chairs, knives, presents, cake etc. I was also involved in the idea making. We created the game using the unity engine. We were 3½ artists and 3½ programmers in order to create the game. The game was made from idea to final presented game in 48 hours. I made a few LEGOs and played around with some dynamics for an hour and a half. Great fun. Horse Carriage: Update - Body sculpt nearly done - And a little portfolio update. I am working on my portfolio pieces, and it is coming together faster than I expected. I like the outcome of the wood so far, although it has been taking quite some time, finding the right tool to carve the wood. I still aim to get my portfolio ready for January, having both my carriage, Saga's Observatory scene, perhaps a character, and some other assets. But it all boils down to how much time I'll have next to my study. One thing is definitely sure, I'll add my quadruped - Perhaps a few 2D pieces, but I'm not sure yet - as I'd like to keep my portfolio small, but showing off the best - and stuff related to the field I'd like to work in. My rococo style horse carriage! I am currently Zbrushing all the detail to the base mesh I made in Maya. I have already done a few test bakes in Xnormal and it is coming out quite alright! 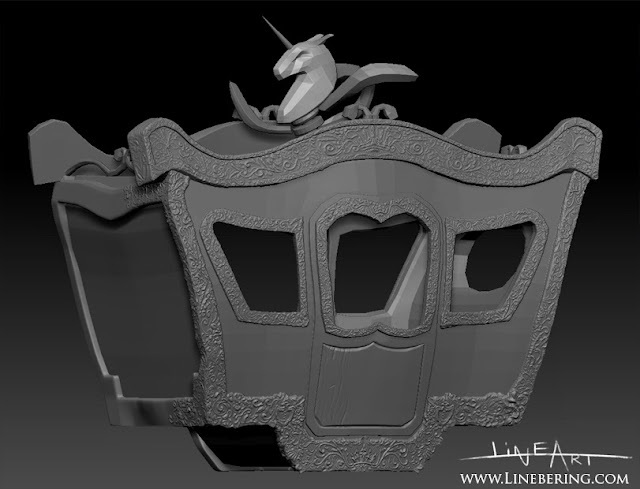 So, I will sculpt the rest of this, the wheels, the ornaments, suitcases and interior and then I'll bake it out, and pop it on to a low poly model, which I yet have to finish. My aim is to give the textures a World-of-Warcraft look, as the style and techniques used at Blizzard are always inspiring to me. 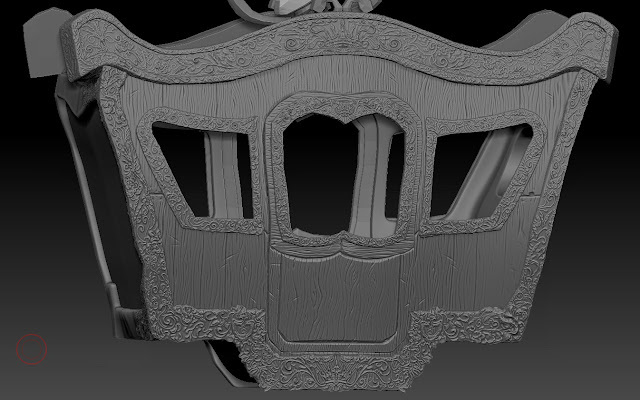 It has been a challenge getting the rococo look through, using mainly textures, to avoid modelling the rococo shapes, as it would increase the polycount. 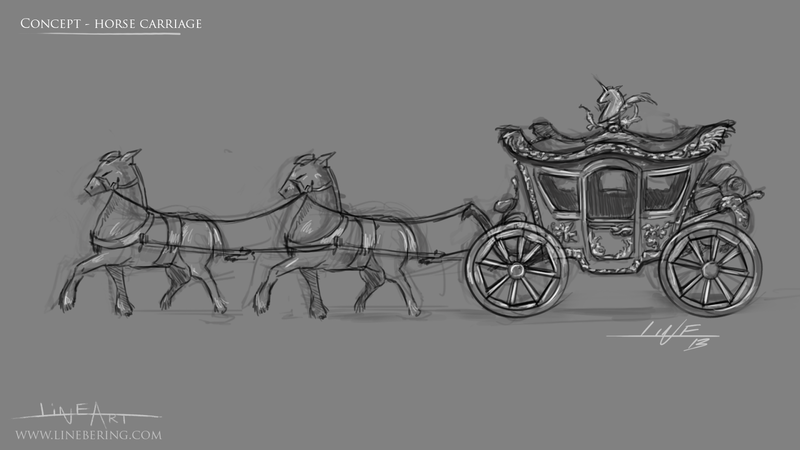 The horse Carriage project I am working on in my spare-time next to university, is getting along quite nicely. 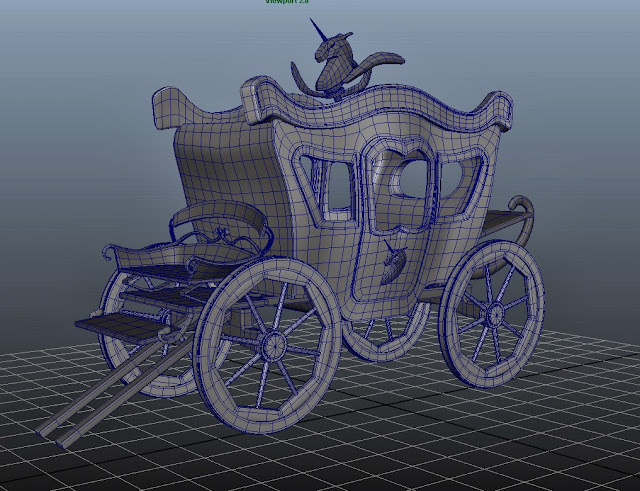 I aim to bring it into Zbrush and start the Rococo sculpting, which I think will be a great challenge, and a lot of fun. Update - Progress and a new project. I have just started my 3rd year at The Animation Workshop. As always I spend my spare time, creating art work related to games. My observatory scene (as found in earlier posts) is coming along nicely. However at the moment it is on hold, while I do a bit more research of how to optimize the texture space. In the meantime, I have begun another project I also wish to include in my final show-reel. 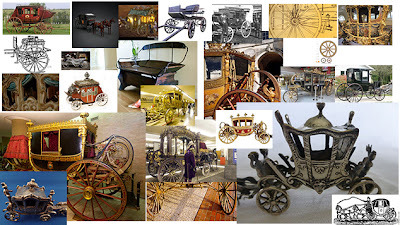 My plan is to create a horse carriage (w/o horses). It will contain a lot more polygons than my previous game-works as well as baked textures from xNormal. I plan to use detailed and more technical references for the sculpting phase. Here are the main pieces modeled in Maya. 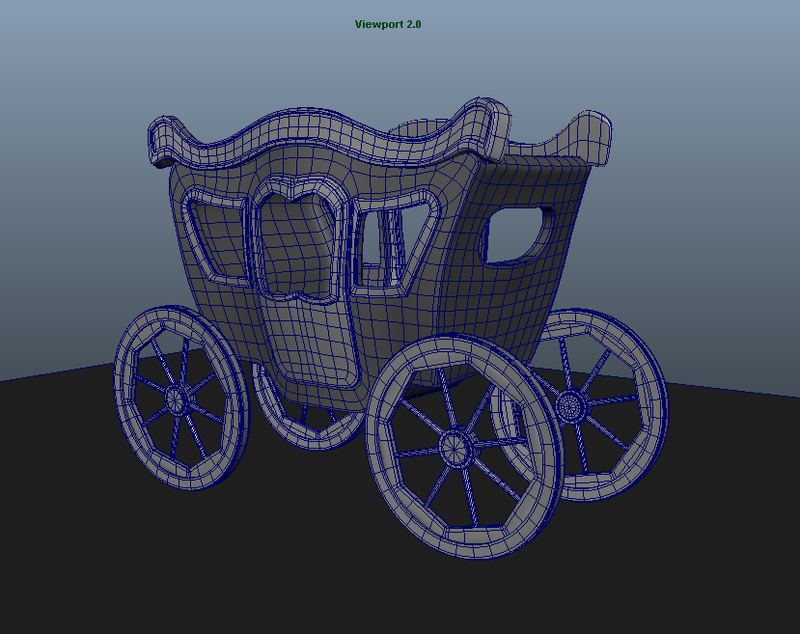 Now I just need to add the detail - Uvmap it and bring it into Zbrush, so I can begin making the sculpt. Once that's done - I will bake it on to a low-poly version in Xnormal. First I need the game-asset version - then later V-ray version! 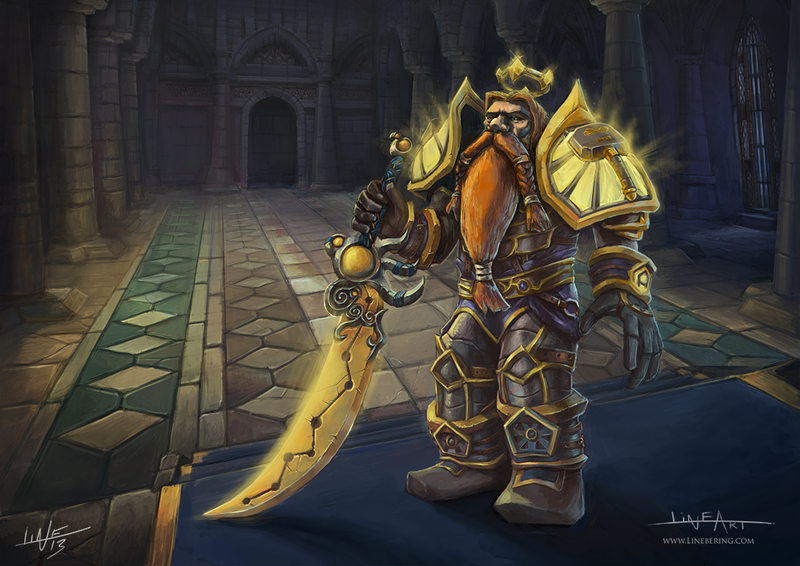 I received a commission to paint a fellow's World of Warcraft Character. It came out like this, I'm quite pleased with the character, but I feel I could put a lot more time into the background. Unfortunately, I did not have the time to polish it as much as I wanted. Maybe one day, the background could do a revisit. The background is partially a paint-over of a screenshot. Line Bering(c). Fantastisk A/S tema. Leveret af Blogger.